Linear performance guarantee: BISOL BMU-280 solar panels cover the linear decrease. Every year, you can be assured that your BISOL panels display the expected performance curve.the reduction in the second year is only 0.5%. After 25 years, an output power of at least 85% is guaranteed. An innovative and secure solution. Polycrystalline cell with color defect: The 60 BISOL polycrystalline cells have visual defects: a non-uniform colour, which does not impact the electricity production. Cutting cell sorting by colour in the standard production process allows BISOL to optimize its production costs and to offer you the products for your large-scale projects at a more competitive price. Anti-PID treatment: The PID effect is a static charge which is created between the solar panel's frame and the crystalline cell. After 2 to 3 years, harmful effects are quickly visible. The phenomenon is characterised by a decreased production of your solar panels. Thanks to chemical treatments, BISOL cells are anti-PID guaranteed for the next 25 years. 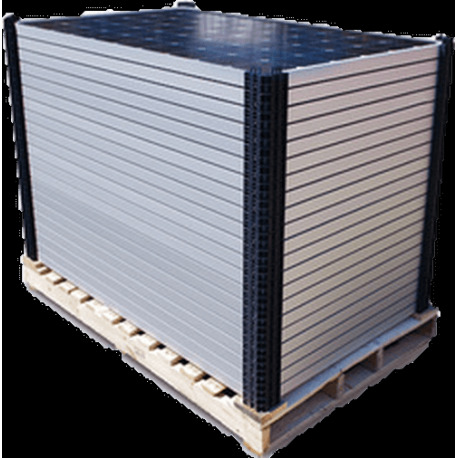 Low price: sold by pallet of 28 pieces: The BISOL pallet consists of 28 solar panels. This makes a lower price possible: You can cover the needs of your large-scale project at a competitive price.